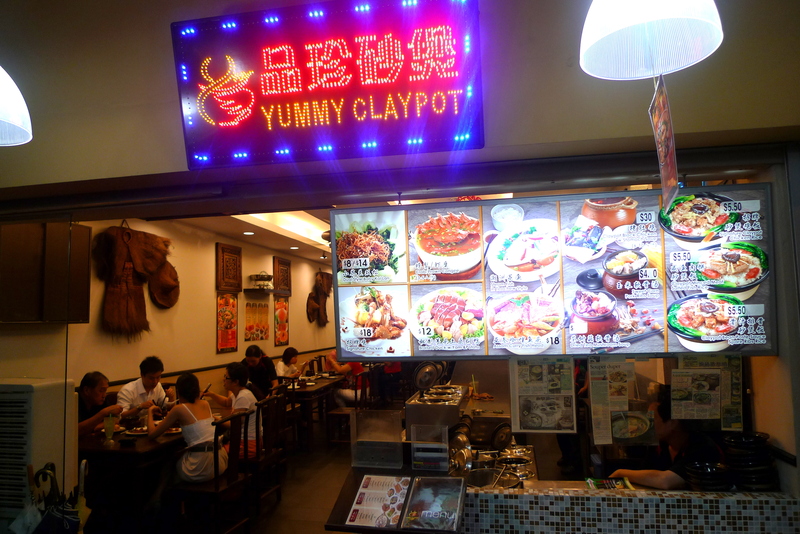 Mum told me she saw this Joo Chiat eatery called Yummy Claypot being featured on a Mandarin television programme called 城人杂志, for quite a while now I have been thinking the show is actually called 成人杂志 (which translated to English literally means Adult Magazine…lol), and since it is situated in close proximity to my place, we decided to have a family dinner there. 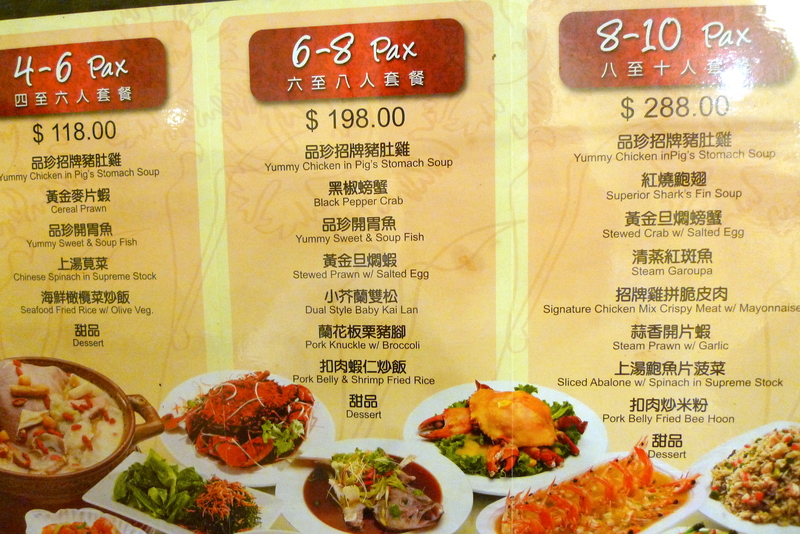 I was impressed at the variety of dishes on offer after a quick perusal of the menu. We didn’t really know what the specialities were apart from the Yummy Chicken in Pig Stomach Soup so we ended up ordering the 6-8 Pax Set Meal for the 7 of us to save us from the hassle of ordering ala carte, after all it’s only logical that the restaurant would try to include as many chef’s recommendations as possible in their set menus right? Portion wise, the set meal proved to be more than sufficient, considering that 2 from my party are my octogenarian uncle and auntie while my dad and another auntie are also already in their 60s. I knew that going for a meal under such conditions was gastronomic suicide since I always end up being the rubbish bin object of affection whereby everyone will coerce me to eat more because I’m “skinny” or “losing weight”. Apparently, age must be taking a toil on their vision. The Yummy Chicken in Pig Stomach Soup involves stuffing a whole Spring Chicken into a Pig Stomach and cooking it as a Chinese Herbal Soup. It’s very interesting to watch as the waitress starts cutting open the Pig Stomach to reveal the hidden Chicken. I felt that cooking the Chicken is such a fashion left it more tender and succulent with a light tinge of pink as it slow cooked within the protective layer of Pig Stomach. 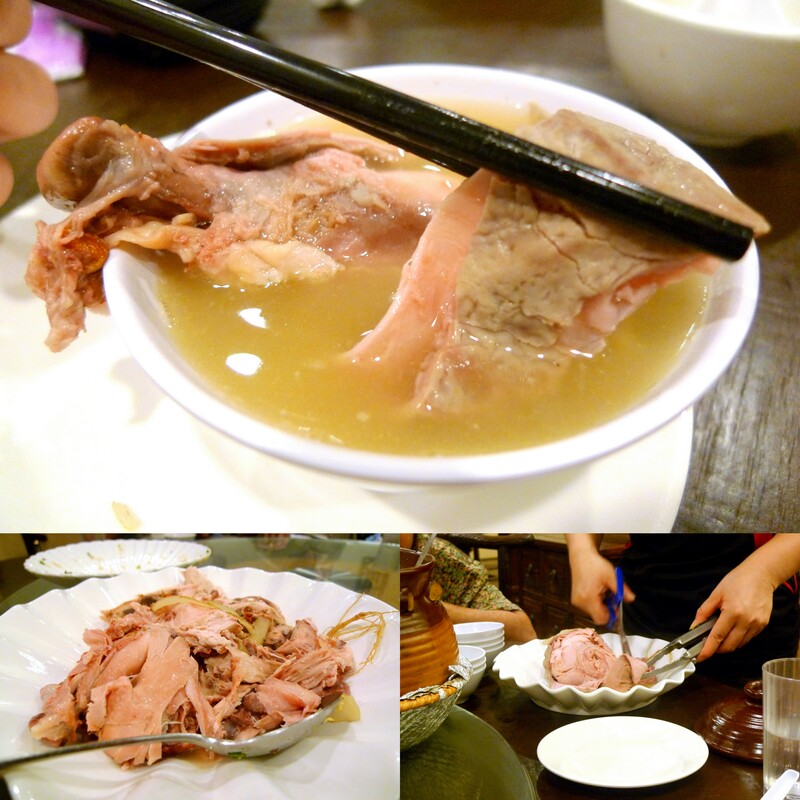 Combining a peppery Pig Stomach Soup with a Herbal Chicken Soup is indeed a stroke of genius! 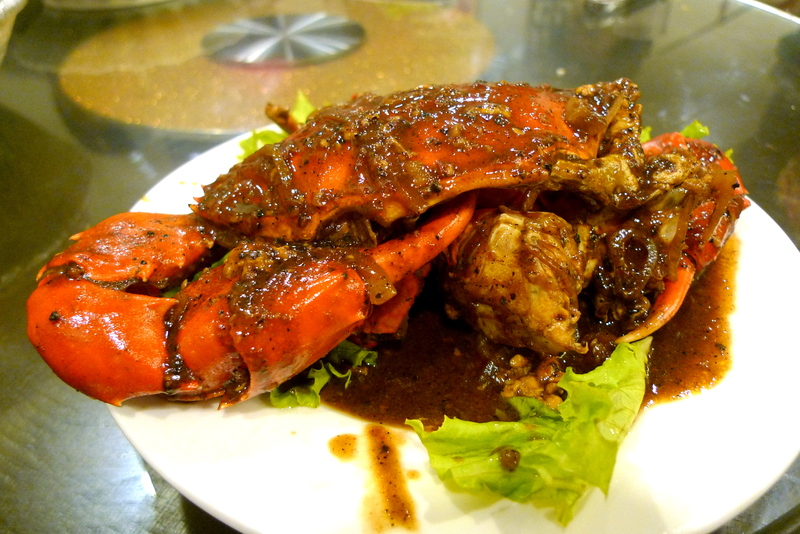 The crab used for the Black Pepper Crab was a medium sized Sri Lankan one. Since this was no Seafood Restaurant, it came as no surprise that this wasn’t executed well. The black pepper sauce was too salty and watery for my liking and the crab seemed slightly overcooked, hence losing it’s natural sweet juiciness. 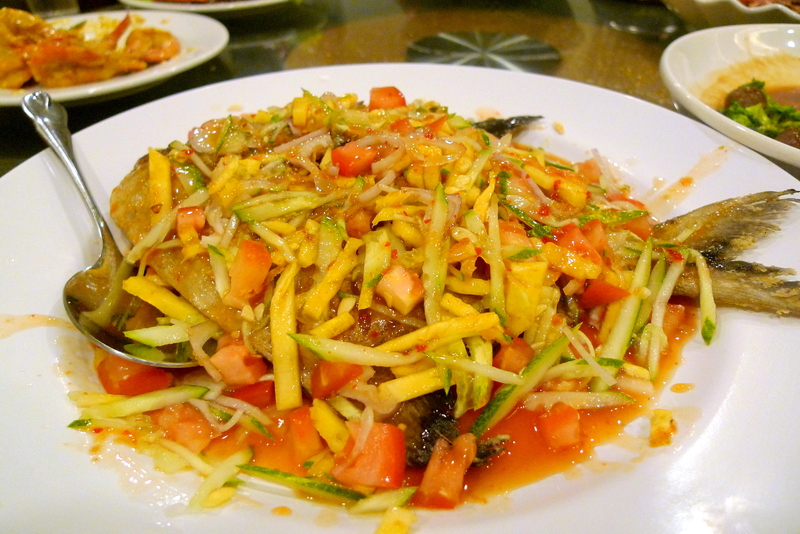 The Yummy Sweet & Sour Fish was a Deep Fried Promfret with Pineapples, Cucumbers & Tomato. The Fish was fried nicely and fresh which I feel are the 2 more important elements of a Fried Fish. 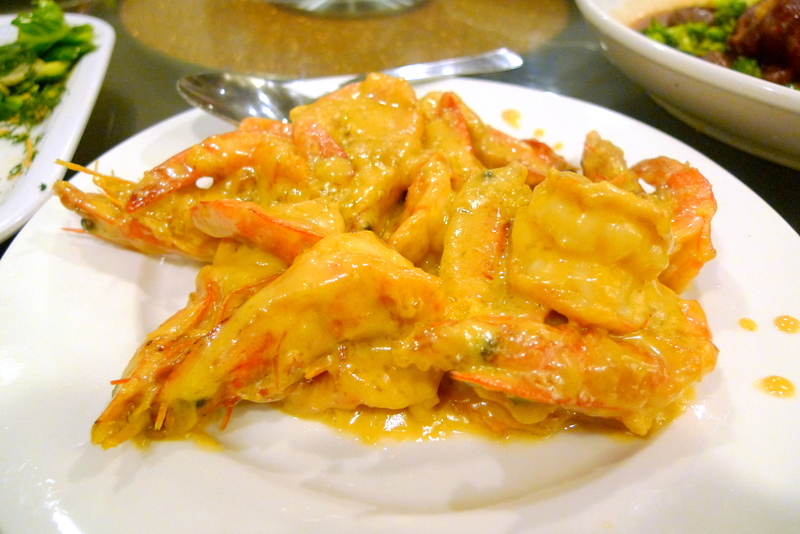 Stewed Prawn with Salted Egg was pleasant but nothing very extraordinary. Dual Style Baby Kai Lan was another dish that I found interesting. 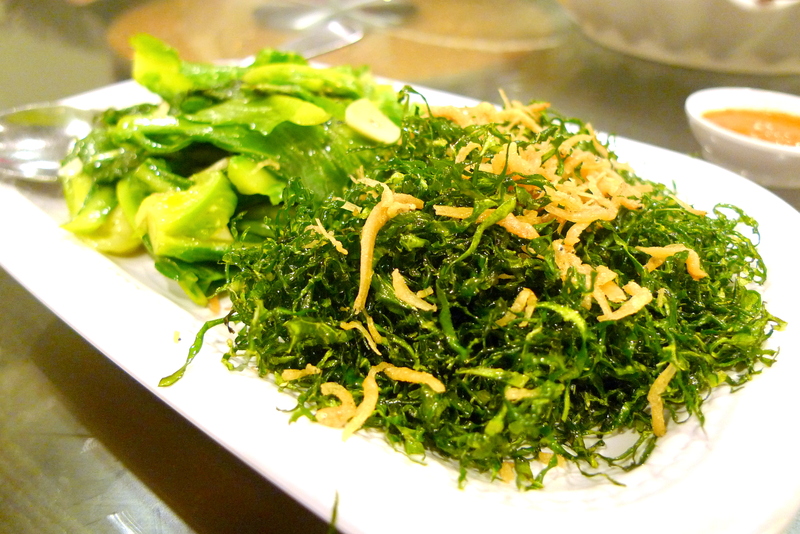 1 Style was the normal 油菜 while the other was a deep fried shredded baby kailan topped with small fishies(is it white bait?) which tasted much like crispy seaweed. I’m sure that picky children would gladly eat this savoury vegetable. 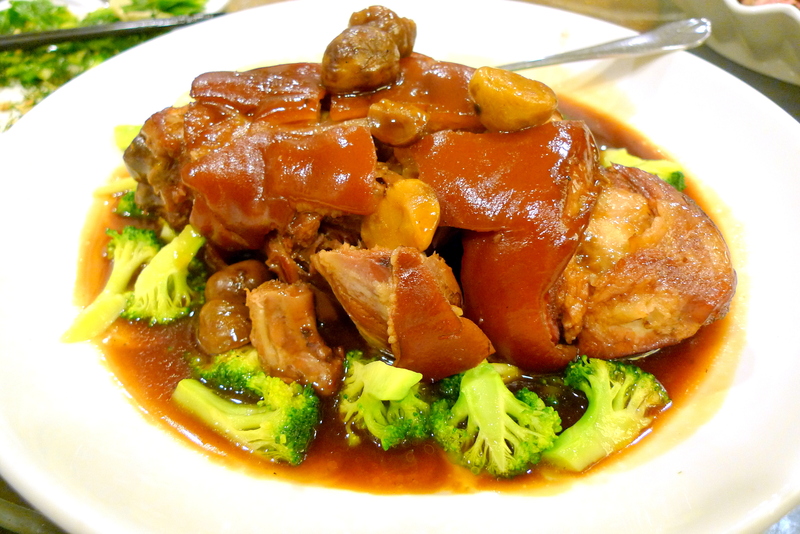 One of Dad’s favourite dishes, the Pork Knucle with Broccoli here came as a disappointment. The Knuckle didn’t give us the melt in your mouth effect, probably due to not being braised long enough. The gravy was thin and unappetizing as well. 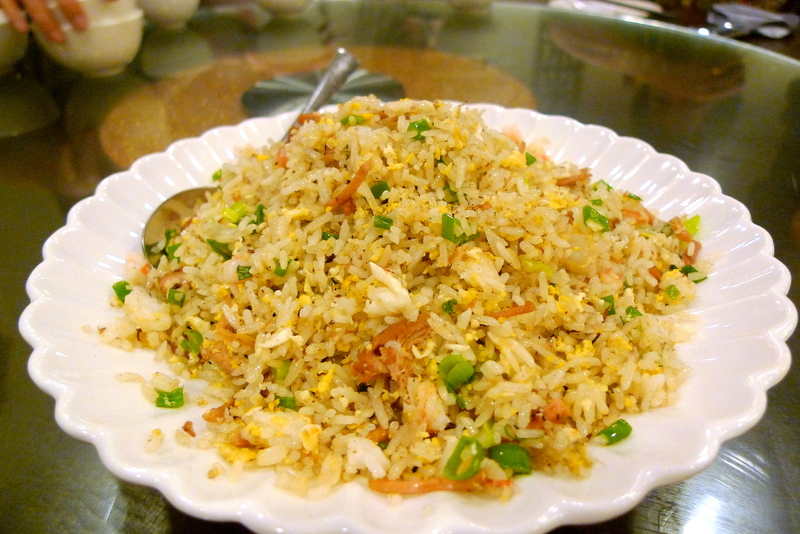 The Pork Belly & Shrimp Fried Rice sure was tasty though with generous servings of stewed pork and fresh prawns. As expected, this was another bout of overeating for me. Fooled by yet another television food programme, I felt that better fare can be readily sought from any decent zi char stall though the Soup and Dual Style Kailan was surprisingy good. For any potential patrons who are thinking of ordering the Yummy Chicken in Pig Stomach Soup, Plz do call in advance to order since there is only limited servings prepared each day. A plus point though is that they don’t charge the GST or Service Charge, so I can’t really complain about their sluggish service. Below are listed some in the more important things you should consider. Porcelain is also used in many other industrial applications including dental aids.